A great opportunity to have an 80 acre parcel for your own hunting hobbies and or camp! This parcel is a great mixture of low and high land making it a perfect habitat for a variety of wildlife. Deer, bear, grouse, turkey, rabbit, duck and geese could all be found dwelling in this wooded parcel. Atv trails and snowmobile trails are very near as well. The access would be granted upon the sale taking place. 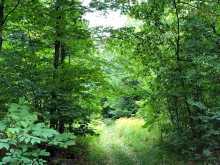 Seller is offering a Land Contract with the right terms. This may be worth checking into!